Jack Chandra (orange coat) and helper mix eggs and water as they move down the planting fork. Taieri River Salmon. Photo Monty Wright. The Taieri River is known throughout New Zealand as one of the better brown trout fisheries in Otago. 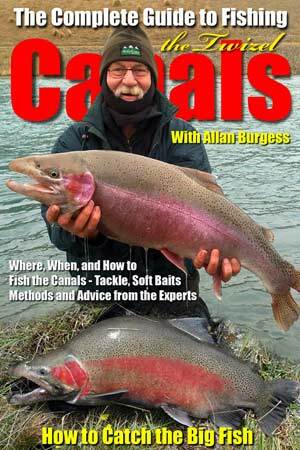 Its trout fishery appears to consists of three major populations. One is located above the Pareau Dam and in the small tributaries. Surplus brown trout fry from this population used to move on downstream into the Maniototo River reach. But since the building of the combined irrigation and power scheme, the majority of these small fry now go down through irrigation races in summer and are lost on paddocks. Others go through the two power stations and survive to restock various small ponds within the hydro and irrigation system. The second population is the resident trout stock from the Maniototo to the sea. It is complemented by a third grouping – a sea-run trout population which enters the Taieri River to travel upstream and spawn. They enter the river from the sea at any time from November through to mid-May. A lot of the small tributary streams are utilised by this population and the sea run trout travel up the catchment as far as the Kyeburn River. Some of the small creeks and springs in the Kyeburn are very important to this population for spawning. Over the years a few sea run trout have missed the Kyeburn turn off where most of these fish spawn. The few that do pass the Kyeburn appear to mix in with the resident group and spawn in a few places throughout the Maniototo Plain and in some of its tributaries such as the Sowburn and Pigburn. Although we know a great deal about the brown trout population, little is known about its cousin, the salmon. l say “little” because as a salmon population it is small. The entire run appears to be between 300 – 400 fish at the most. It has been hard to track down where the salmon spawn within the catchment although we know that some of the small streams around Mt Allan have been used in the past. These fish are generally no larger than about 2.5 kgs (5 lb). One further group of salmon travels upstream to the Hyde area to spawn. Again, these are small fish. In fact smaller than the ones using the tributaries downstream around 2 kgs in size. There is a further subpopulation which uses the main stem river around the Sutton area for spawning. This average size in this group is much larger – around 4.5 kgs. They rest in several holes through the Taieri Gorge from Outram to Sutton and it is an amazing sight to watch them on their travels upstream. During the summer of 1994/1995, the Otago Branch of the New Zealand Salmon Anglers had many enquiries from Mosgiel residents about the possibility of improving the salmon ﬁshery in the Taieri River system. This was taken up with Fish and Game Otago by the local Otago Branch Committee and a public meeting was held in Mosgiel to gauge interest. It was attended by 84 people and it was decided to go ahead with the project. Implanting eggs was by far the cheapest option and about 100,000 eyed ova would be needed. A small committee chaired by Roger Miller from East Taieri was set up and received assistance from Jack Chandra, then President of the Otago Branch. Laurie Mains kicked off the fund-rasing by giving a signed rugby ball from the World Cup All Black team. Keith Robinson, the Secretary, has been doing the paperwork together with Fish and Game staff who started on the consent requirements. The salmon eggs duly arrived from Silverstream Hatchery in Christchurch at 6.30 on a Friday night and were kept in the apple cooler at East Taieri for the night. Twenty-one excited anglers then travelled to the Maniototo where the eggs were implanted in a suitable gravel run under the guidance of Ron Docherty, President of the New Zealand Salmon Anglers, and myself, representing Fish and Game Otago. Eighty thousand eggs were planted in the ﬁrst run and a few more will be available soon from the Silverstream Hatchery. 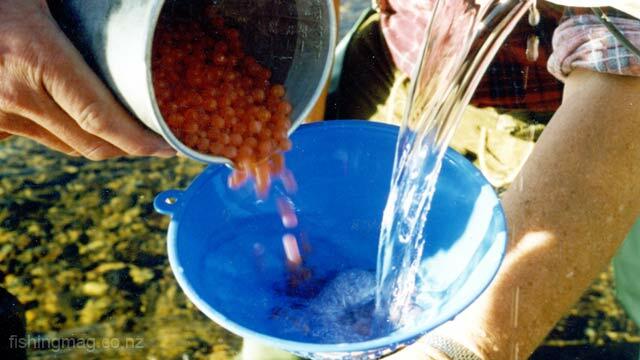 Two systems were used to plant the eggs, the redd fork developed by Dr Donald Scott and the barrel system used by the New Zealand Salmon Anglers. Most of the eyed ova were within a week off hatching and to date we have been fairly lucky with the weather. Although some rain fell on the Wednesday following the implant it was not expected to have any effect on the redds. The Otago Branch of the Salmon Anglers have committed themselves for three years egg implanting in the Taieri River system. Of course, some of this will depend on the amount of money raised to pay for them. Some assistance will also be given from Fish and Game Otago and the possibility of some smelt releases is also being considered. My only hope is that the enthusiasm showed by the group of salmon anglers, and Fish and Game Otago, will produce a good run of salmon to this river system, which it has not had in the past. The first salmon I ever caught in the Taieri was at Hindon. It weighed about 2 kgs and l can remember it well. On that day my father and our next door neighbour, Bert Mains, also caught a salmon each. The fish that Bert caught was one of the larger fish – around 4.5 kgs. Over the passing years, we continually caught ﬁsh above Outram, at Hindon and where the Sutton Stream meets the Taieri at Sutton. l clearly remember walking the railway line home from Deep Stream late one afternoon and seeing a silver sheet slowly making its way up the river. My father and I immediately recognised them to be salmon and left all our gear, except rods and reels, and charged down through the boulder banks to attempt to catch some. My father was the only lucky one. He caught one of the last two or three that were struggling behind the others. For several seasons we fished for these salmon with great success, but the population appeared to slowly dwindle and I lost interest in it and moved on to ﬁsh elsewhere. Salmon have continued to be caught in the Taieri in low numbers up until the present time. Planting salmon ova in the Taieri River, Otago. Photo Monty Wright. In April 1994 a salmon was caught above the Waipiata green bridge by Jim Gratton. It was the ﬁrst of three salmon caught before the season ended on the Upper Taieri. The heaviest of these weighed 9.4 kgs. At ﬁrst it was thought that a few stray fish had headed up the river. A check of the spawning areas in the Kyeburn revealed only the sea run trout had turned up, but in July l was informed about some large ﬁsh which appeared up by the Patearoa No 2 power station. On inspecting these fish they were found to be salmon. This small group ranged from 7 – 9 kgs and they preferred to stay in one place where they eventually built three large redds. On the same visit l went to clear a ﬁsh pass on the Sowburn and to my surprise, jammed on the upper lip of the ﬁsh pass was a salmon kelt. On further inspection several more were found. Unfortunately, after inspecting the stream above the pass, no redds were visible as we had had a flush of water three days before, which had obviously flattened out any redds that may have been built. There are several questions to be answered here and the possible scenario is that one pair of salmon had built a redd in the vicinity of the Patearoa power station, maybe three seasons ago, and these were possibly the returning young fish. Of course, this same scenario could have also occurred in the Sowburn. A considerable amount of work has been done in the Sowburn over many seasons and salmon smelts or spawning ﬁsh have never been recorded there in the past. There has been some concern from brown trout anglers that this project may have an adverse effect on the trout fishery. Information gathered about juvenile salmon over many years shows that they do not, as a rule, stay in the river system very long after hatching. Although they are competing for food with the brown trout fry early on in their lives, they assist the natural population thinning process caused by competition, and when the salmon move off downstream to the sea the stronger juvenile brown trout that remain do particularly well.